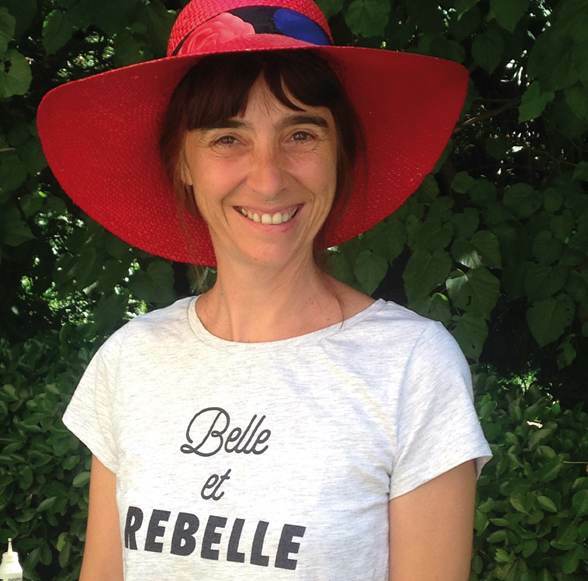 Editor-in-chief since 1996 of the monthly Rebelle-Santé, dedicated to natural health, Sophie Lacoste is a pioneer in this field. Convinced that there is not only conventional medicine for self-care, she founded her own journal and has been exploring the different aspects of natural health (well-being, nutrition and of course, cosmetics!) for over 20 years. Portrait. From the beginning of her career, Sophie Lacoste has always been a journalist and has shown a keen interest in health issues. This curiosity probably comes from the trials she went through in her youth. “I lost both my parents to illness, my father when I was 7.5 years old and my mother, shortly before I turned 18. She tried to treat herself differently. She had read a book by Carl Simonton on visualization and had taken up macrobiotics. At that time, her illness had gone into incredible remission,” she says. As a young journalist, Sophie Lacoste wanted to “save the world”. Realizing that the task might be a little complicated, she approached the Editor-in-Chief of TV Magazine, the weekly supplement of the regional newspapers, and suggested that he create a health section. After three months of reflection, he accepted. Very quickly, her articles were a real success. More and more readers write to her and solicit her on questions left unanswered by their doctors. “I remember a lady who wrote to me about a tinnitus problem. Her doctor told her there was nothing to do, except this drived her crazy. So I did some research and found that Cimififuga (editor’s note: a plant) could be a great help,” she says. As Sophie Lacoste’s health section in TV Magazine had a limited space, she decided to launch her own magazine in order to collect and share as much information as possible about natural remedies and without side effects. In 1996, she inaugurated the first 16-page issue of Rebelle-Santé, in black and white. It was then called “Le Journal de Sophie Lacoste”. Sophie Lacoste thought of her monthly magazine as a large basket in which readers pick what they need, according to their ills, their condition and their desire. The goal is to allow them to regain some control over their health, without risk, of course. Attention, to all those who think that Sophie Lacoste is a kind of anti-medicine guru, this is not the case! It is not a question of turning your readers against the medical profession, but rather of making them think about how you approach your body. “I recognize the importance of conventional medicine, I’m not crazy. Fortunately, we can be cured and science is progressing day by day. But simply, before throwing yourself into synthetic medicine, you can try softer and healthier methods,” she says. “Exchange is essential,” says Sophie Lacoste. That is why it leaves so much room for its readers. Rebelle-Santé is an opportunity for them to confide, testify and also to advise each other. They often write to each other, give each other news and support each other in their struggles. “It’s a bit like a soap opera and it’s very pleasant to connect with people from here and elsewhere,” she enthuses. Social commitment is also important for Sophie Lacoste. Readers will be able to find, in the March 2018 issue, an article on the “Nous voulons des coquelicots” movement launched by Fabrice Nicolino (call for resistance for a ban on all pesticides). “Relaying information like this helps to inform people and remind them that you can make a difference. It’s another way to take care of yourself,” she says. Gone are the days when Rebelle-Santé was only about fifteen pages long and printed in black and white. Since 1996, this monthly magazine has brought together a growing community of readers. And today, her magazine explores all aspects of health, including the environment, but also well-being and responsible consumption in all its forms, with many sections to regain control over one’s lifestyle. Gardening, animal care, crafts and recipes, gluten-free cooking or homemade cosmetics, are featured in each issue! “At the beginning of my career, I was nicknamed the Folle des Plantes (Crazy about Plants) because I was talking about herbal medicine and natural health. Today, I see that these areas are becoming more and more people’s daily lives. I wasn’t that crazy after all,” she says. Visionary, did you say visionary?